Your chances for success during a food challenge mostly depend on the factors that you fully control yourself. If you selected a challenge that you are physically capable of winning, trained appropriately for that particular challenge, and put together a flawless eating strategy, your chances of winning are obviously very high. There are some factors though which are beyond your full control, and you are only able to influence the outcome rather than fully dictate. The most important exterior factor that you need to be concerned with is the preparation of your food and how everything will be cooked. The meal is always prepared by the chefs who have been trained to cook everything appropriately, but there is no guarantee that the chef’s view of “appropriately” is exactly the same as what you are expecting. For very meaty challenges including steaks and burgers, the main factor that you need to be concerned about is how your meat will be cooked. Restaurants are legally obligated by health codes to prepare chicken, pork, and most other meats to a certain standard and temperature, but beef has a totally different set of rules. Beef can be ordered rare, medium rare, medium, medium well, and well done, and sometimes there is only a minute or two difference between each option. How that meat actually gets cooked has a big influence on how easily you will be able to bite, chew, and swallow it during your challenge. The larger your piece of meat is, the more importance you need to place on telling your sever and chef how you want it cooked. Most of the time, your server will ask how you want your meat cooked while you are ordering the challenge, but you still need to remember to mention it in case she forgets. He or she most likely will have other tables and families to worry about too, so that person may be distracted and thinking about other things. You may even want to go a step further and tell the chef or kitchen manager yourself how you want your food prepared. No matter what you have to do, you need to make sure that the chef preparing your meat knows that you want it cooked MEDIUM RARE. 1. Well done, dry meat will take much longer to consume – As meat becomes more and more “done” to the point of being “well done,” it continues to become more and more dry as juices evaporate. Medium rare steaks and burgers are very juicy and tender, but “well done” ones are dry and tough. 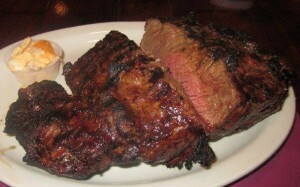 I have eaten an 87 ounce steak in less than fifteen minutes and I have done many 72 ounce steaks in over forty minutes, using the exact same eating techniques and strategies. Why such a big difference in times? The 87 ounce steak was cooked medium rare, just like I asked. Even though I asked that the 72 ounce steaks be rare too, the chefs cooked them too long and dried out all the juicy tenderness. I had to spend a much longer time cutting and chewing the meat before I was able to swallow it. A few additional seconds on each bite of a 72 ounce steak really adds up quickly as you continue eating. Not only will you spend more time chewing each bite, but you will have a harder time chewing which is going to make your jaw get really tired really quickly. It will be very hard to finish the last few pounds of dry, tough meat with a sore jaw, so make things much easier and be sure the meat is prepared medium well. 2. Well done meat requires extra sauces and liquids – As mentioned above, medium rare steaks and burgers are very juicy and tender, while “well done” ones are dry and tough. If you are eating a properly cooked medium well steak or burger, you should not even need to use any type of steak sauce. You should not need to drink any water or liquids to help chase it down your throat either. If the restaurant uses a quality piece of meat, you won’t even want to ruin the flavor with extra sauces and liquids. You will be able to happily chew and swallow the meat easily without any extra help. If the meat is dry and well done though, you will most definitely need to use extra sauces to make it taste better and extra drinks to help you swallow and consume it more quickly. Your challenge will most likely have a time limit, so you don’t have all day to sit there chewing your steak or burger. You may enjoy the first pound of well done meat, but you won’t be enjoying the next few pounds after the flavor weakens, and you will especially hate the last pound that is cold and flavorless. To get those bites down, you will have to dip them in sauce and then chase them with liquid. If your challenge is very large, you may not have the stomach space available to waste on a few extra cups of liquid. By choosing your burger or steak to be served well done, you are more likely to run out of time or run out of stomach space, both resulting in you failing the challenge. 3. Medium rare meat will allow an overall better challenge experience – When strategizing for a food challenge, you cannot always think about the meal as just one much larger version of what you would order normally. You may like one 1/2 pound burger patty cooked well and loaded with toppings, or you may enjoy your twelve ounce sirloin steak cooked well along with some steak sauce, but those are nothing to compare challenge-sized meals too. You may enjoy the first two well done burgers and you may love the first sixteen ounces of your steak, but remember that there are two to four other pounds to eat!! I can tell you from firsthand experience that cold, dry, really tough burger meat is not very appetizing after you have just finished five pounds of other parts of the challenge, including most of the burger before it got cold and disgusting. Getting your large burger patties and steaks ordered medium rare, or medium at most, will provide a much more delicious and overall better challenge experience than you will get if you are served a well done piece of meat. A juicy burger will make the rest of the burger taste good too, even after eating three other pounds of it. Think BIG just like your challenge will be. At the end of the day, how you order your steak or burger is completely up to you and your personal preferences, but know that the above tips are based on years of experience, consultations with other professional eaters, and lessons I’ve learned through many, many burger and steak challenges. They apply to burgers whether your challenge has one large five pound patty or sixteen quarter pound patties. How your meat is cooked has a much larger impact on larger pieces of meat, but there is definitely a significant difference made on smaller cuts too. Even when I am eating multiple quarter pound or half pound patties, I can still easily tell whether they were cooked too long or cooked just right. Medium rare patties are juicy, tender, and can be eaten much faster. They are much more delicious too!! For an example of why you should get your steak and burgers cooked medium rare, check out this video of me defeating Meat House’s 72 oz Steak Challenge in Dundee, Scotland. I finished in 37 minutes and 45 seconds. You can see in the video that the meat was juicy and tender which made the challenge experience a great one. If you typically order your beef to be cooked anything more than medium (medium well or well done), next time you are eating a burger or steak like that, just ask yourself whether or not you would enjoy four more pounds cooked the same way. Order your beef steaks and burgers to be cooked medium rare (medium at max), and you will have a better overall experience with a much higher opportunity for success. Thanks for reading how to get your steak or burger meat cooked and for using FoodChallenges.com! !